More than halfway into the 86th Texas Legislature, scope of practice and maternal health have medicine playing defense and offense, respectively. Check out Texas Medicine’s Bill Watch on these issues, while brushing up on TMA’s overall Healthy Vision priorities for the 2019 legislative session. Please contact your state lawmakers today through the new TMA Grassroots Action Center. Let them know you support physician-led, team-based care. Tell them how much you learned in your years of medical school, residency, and beyond. Tell them why APRNs are NOT the answer to Texas’ physician shortage. Ask them to say “No” to the APRNs and to help the Texas Medical Association stop them. The sentence has appeared in every edition of the Texas Medical Association’s Healthy Vision series since the first Healthy Vision 2010 was published 14 years ago: “TMA opposes any efforts to expand any health professionals’ scope of practice beyond what is safely permitted by their education, training, and skills.” That focus on safety remains an integral part of Healthy Vision 2025, published last week. And that sentence remains, verbatim. What Do Opioids, MOC, and Lawsuits Have in Common? Texas’ new opioid prescribing rules, board certification, and lawsuits top the list of popular topics that Texas Medicine Today covered this year. Want to know what else intrigued Texas physicians in 2018? That was the warning C.M. Schade, MD, past president of the Texas Pain Society, delivered as he finished listing the society’s priorities for the 2019 Texas Legislature during the Texas Medical Association’s annual Advocacy Retreat on Saturday morning at the Renaissance Austin. 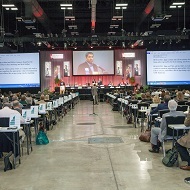 Physician assistants one day might go by a different name under a resolution the American Academy of PAs (AAPA) passed during its annual conference in May. Should Texas Change the Rules for APRNs? Texas is facing a chronic physician shortage, especially in rural areas and urban cities. Some argue that giving advanced practice registered nurses (APRNs) more leeway to prescribe and treat patients will help address that shortage. But is that a workable solution? TMA strongly opposes proposed new state rules that would continue to allow chiropractors to practice acupuncture and to perform other procedures and services outside the scope of practice for chiropractic. Does Hospital Plan to Give CRNAs Autonomy? The Texas Society of Anesthesiologists is questioning a Corpus Christi hospital’s decision to replace its long-time anesthesiology team with a group it says appears ready to give certified registered nurse anesthetists more autonomy than Texas law allows. The TMA, AMA, and other state medical societies are asking the National Council of State Boards of Nursing to remove or revise parts of an interstate compact that would alter state scope-of-practice laws for advanced practice registered nurses. We won! In a final judgment by Travis County District Court Judge Rhonda Hurley, TMA prevailed in its long-held declaration that the Texas Board of Chiropractic Examiners' rules permitting chiropractors to make medical diagnoses and perform other medical procedures exceed the chiropractic scope of practice. Texas needs more physicians and other health care professionals working in all parts of the state, especially in rural and border Texas. But the real gains in improving access to and coordination of patient care will come largely from solidifying and expanding the use of physician-led teams. Team-based care capitalizes on the efficiencies of having the right professional providing the right services to the right patient at the right time … with overall direction and coordination in the hands of physicians. What Services Can Non-Physician Practitioners Provide and How Should I Bill? Physician Supervision of PAs, NPs, and Other Personnel In the Medical Office. What Are the Guidelines and Regulations for Employing a Physician Assistant? What could a TMA membership mean for you, your practice, and your patients? In a scope-of-practice victory for medicine, the Supreme Court of Texas upheld the Third Court of Appeals' decision that the Texas State Board of Examiners of Marriage and Family Therapists' diagnostic assessment rule exceeds the scope of marriage and family therapy. Physicians across Texas are breathing a sigh of relief — at least for now — thanks to Harris County Probate Judge Rory Olsen's decision to allow doctors of osteopathy (DOs) to file Certificates of Medical Examinations needed for mental health commitments. TMA and a host of other physician organizations have been fighting the judge's initial ruling, which prohibited DOs from signing the commitment papers. TMA is fighting the Texas State Board of Dental Examiners' (TSBDE's) proposed rule changes for dental treatment of obstructive sleep apnea. TMA supports the Texas Medical Board's (TMB's) Position Statement on the Practice of Sleep Medicine and Dentists, which clearly states "the diagnosis and treatment of sleep apnea are the practice of medicine." TMA has a number of tools to help physicians manage nonphysician practitioners (NPPs) properly. Respond to Action Alerts. Some bills will be particularly important to TMA, and we request your assistance in either supporting or opposing those bills. Through our Grassroots Action Center and mobile app, VoterVoice, you’ll be able to respond on the fly, sending a message directly to your legislator.